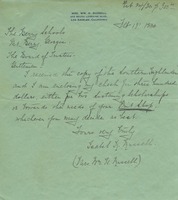 Everett Stewart writes to The Berry Schools to commend their work on The Southern Highlander, saying he particularly enjoyed this issue because he was recovering from an operation and had the time to read it but also because he enjoyed the pieces on the new couples, Oak Hill, and Mr. Keown. He says that he receives quite a few similar publications but none are as persuasive, attractive and beautiful as The Southern Highlander. A few names and addresses are sent to be added to the Southern Highlander mailing list. Mrs. Daniels sends Martha Berry a donation and lets her know that she hopes ot send enough for a yearly scholarship. Miss Chase asks for a copy of The Southern Highlander. 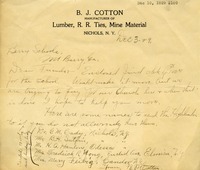 Mr. Pounsford writes to donate a scholarship with the recipient left at Miss Berry's discretion. Wm. 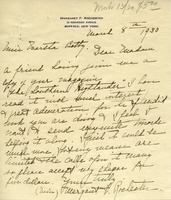 S. Davis writes to Martha Berry saying that he appreciates her work with the boys and girls, saying he is happy to contribute a mite to the work. He also mentions how much he enjoys The Southern Highlander. 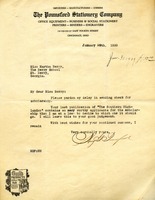 Lucy B. Bliss sends Martha Berry a money order for $2 and discusses her efforts to advertise the work of the Schools in an attempt to help them acquire donations. She also mentions her desire to travel the Southern states, but her inability to do so due to the heat and insufficient funds. 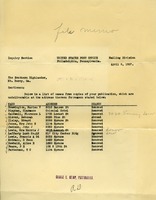 The U.S. Post Office sends a notice of the names of subscribers to The Southern Highlander whose addresses were undeliverable.